Home EDUCATION Education Ministry to use M-PESA Academy to benchmark new curriculum. Education Ministry to use M-PESA Academy to benchmark new curriculum. M-PESA Foundation’s CEO Les Baillie (left) taking Education CS through the operations of the institution. Looking on is Safaricom CEO Bob Collymore and ICT Cabinet Secretary Joe Mucheru. Education Cabinet Secretary Fred Matiang’i has identified the M-PESA Foundation Academy in Thika as a key institution to assist his ministry in actualising its goal for a new curriculum. Speaking to press after a tour to the facility, the CS revealed that they will organise a day’s training at the academy which he said reflected the module the new curriculum was set to shape to. 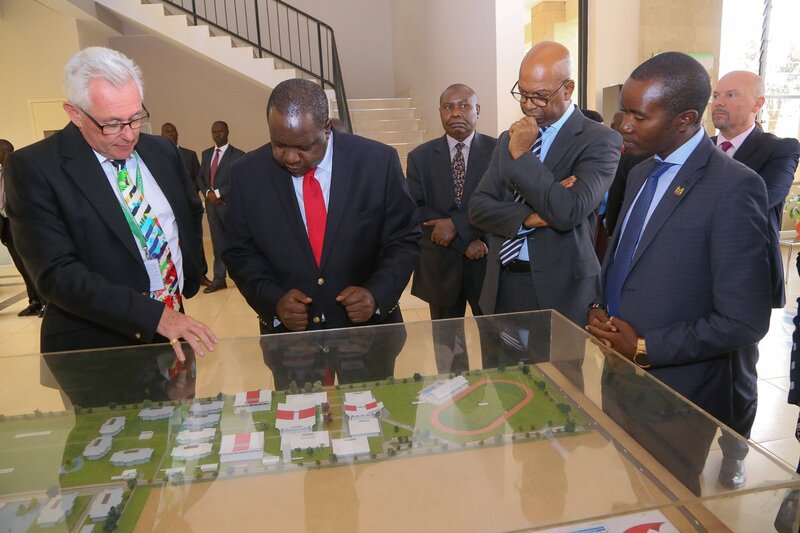 Matiang’i reckoned that the institution had adopted an innovative pedagogical approach that mainly focused on professional development of students which was in line with his ministry’s vision of the curriculum. He added that they will adopt a learning model similar to this as they developed the new system of education. The CS expressed his admiration for the institution’s learner-centred system approach to teaching which he said nurtured talent. “What we have witnessed here is mind-blowing. Students are given the opportunity to discover things on their own. This is what we want in our schools. This is what I intend to achieve in changing our curriculum. We want to introduce the academy’s system in other institutions countrywide,” said the CS. He urged the foundation to increase its enrollment from the current 290 to 490 students, 6 from each county, promising to finance the additional students. “We want to produce thinkers, doers and leaders in our learning institutions and the government is working round the clock to ensure we give quality education,” he said. However, the CS acknowledged that the country’s education system was still facing various challenges among them limited resources but underscored the fact that there still lied great potential in enhancing the system. He reckoned that the scarcity of resources in the government hindered establishment of institutions like the M-PESA Academy, but said they would partner with the private sector to set them up. “The current teacher-students ratio is higher than required and the ministry is working on how to enhance resourceful learning. We shall bring 20 principals from various schools on a benchmarking tour of the academy. Foundation’s CEO Les Baillie said their institution, that is currently hosting students in Forms one and two, recruited six bright, needy students from every county. He said that even though they had a capacity to admit 900 students, they were only limited to host 290 currently due to financial implications. He added that the academy established at a cost of 50 us dollars was seeking avenues to establish a kitty for students from the institution who after form 6, would like to venture into business. Those who accompanied the CS to the academy included ICT Cabinet Secretary Joe Mucheru and Safaricom CEO Bob Collymore. M-PESA Foundation Academy offers a world-class, well-rounded learning environment to develop the future leaders of the African continent. The Academy places great emphasis on the holistic development of all learners not just in academics but also in technology, music, sports, the arts, outdoor pursuits and community service. It serves talented but economically disadvantaged students with demonstrated leadership potential. Learners are exposed to the latest in technology with the use of iPads and our Learning Management System as part of the day-to-day teaching. The school focuses on molding future leaders and entrepreneurs by incorporating the core values of Curiosity, Leadership, Accountability, Innovation, Responsible Citizenship and Excellence (CLAIRE) into every sphere of learning within the Academy. Admission is evaluated on academic excellence, leadership and entrepreneurship potential, financial need, responsible citizenship, critical thinking and problem solving. The admissions cycle runs from May to November each year and consists of filling and returning an application form and, a multiple stage evaluation process including, telephone and in person interviews, for selected applicants.